Beneath every great piece of art is a great drawing. Randy’s drawing class will be structured to give you the fundamentals necessary to improve your skills and do your own “great drawing”. Whether you would like to be able to do a “vacation sketch”, a drawing for a painting or one to stand on its own, this is the class for you. You will learn various observational skills and drawing techniques including perspective, tonal values with different media, making marks to achieve tone such a crosshatching, shading, etc. You will also learn basic portraiture and the elements of figure drawing. Randy will teach drawing from still life as well as working from photos. She will also introduce various drawing media including, graphite, and ink and washes, as well as experimenting on different papers. Randy Mayer graduated from the Fashion Institute of Technology in New York City, where she pursued a career in advertising and illustration. 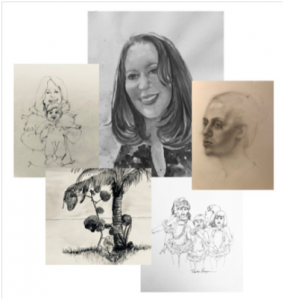 She has studied with many well known artists, including Charles Reid, Ted Seth Jacobs, Roberta Carter Clark, Mel Stabin as well as many others. She is an Exhibiting Member of The Guild of Creative Art, and an award winning member of many art societies. Randy’s current work includes book illustration projects and luminous watercolor portraits and landscapes with figures. Always a student as well as a teacher, she enjoys sharing her love of all things creative. For years she taught classes in drawing, painting, and sculpture. Randy’s drawing class is offered in early afternoon session to students of all ability levels. Instruction will be personalized to suit individual needs and interests, and each student will receive personal attention. Classes will begin with a short demonstration, followed by time for students to work on their drawings. Randy also offers a watercolor class at 11:00 on Thursdays.